We are offering fabrication services for sheds. The sheds provided by us are not only strong but are also durable in character. These sheds are developed in line with the specifications & requirements detailed by the customers. We are looking for queries from Chennaipattanam, Chennai or Madras, Kanchipuram and Tiruvallur. We are engaged in offering Fabrication Service of Sheds. 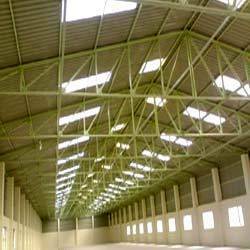 These sheds are widely used in warehouses, manufacturing units and other industrial places. Moreover, owing to their easy installation, these sheds are widely demanded by the customers. Steel meets the requirements of a type of building that protects natural ressources. It can be used to make members that are durable, seperable, dismountable and reusable, taht on the whole use up every little of the earth's non renewable reserves. Lightweight steel-framed constructions are composed of studs and beams made from thin C, U or Z-shaped cold formed sections. Our domain understanding has resulted in providing a qualitative Fixing of Colour Sheets & Corrugated Roofing Sheets to our esteemed clients. Our repute in the market is largely attributable to our popular range of Light Fabrication services from our unique assortment of services. To maintain promptness, flexibility and timely execution, we provide these services. Looking for Sheds Fabrication Services ?